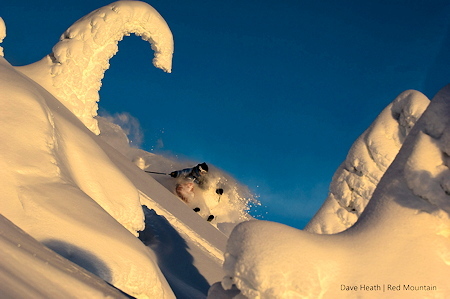 Fresh Adventures Ski Vacations and Guided Ski Tours in British Columbia, Canada. 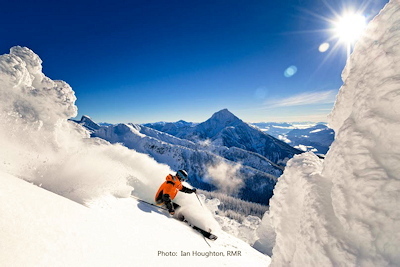 Get more out of your ski vacation in Western Canada by going on a fully guided ski tour with Fresh Adventures. Our professional guides will take you to a ski and snowboard paradise during a road trip along the world famous "Powder Highway". Experience endless terrain and bottomless "champagne" powder at up to four of Canada's best ski resorts during your British Columbia ski vacation. Our ski tours are perfect for anyone from beginner skier and boarders to experts, with tons of options for virtually every skill level. Your ski guides are at your disposal to show you the best terrain for your level at each mountain as well as provide light coaching and tips along the way. Tell your ski guide exactly what you desire and we'll deliver the goods on a silver (actually white and snowy) platter. Your Canadian ski tour will take you off the beaten path, showing you secret powder stashes as well as some of Canada's best kept secrets like natural hot springs along the way. Skiing and boarding with your own ski guide helps you ski the best runs on each mountain. Your ski vacation visits our favourite hand picked ski resorts in British Columbia, which get some of the best powder in the world, and have the shortest lift lines. No Canada ski vacation is complete without experiencing the highest vertical in North America at Revelstoke, the steep, powder filled chutes and bowls at Kicking Horse, the wide-open tree skiing and North America's best and most snow at Whitewater as well as the birthplace of Canadian free ride skiing at Red Mountain. With over 40 feet of dry, ready to rip powder each winter, these BC ski resorts are ready to make your ski vacation the trip of a lifetime. Fresh Adventures takes care of all the details during your British Columbia ski vacation, including all transportation, accommodations and lift tickets, as well as help you arrange optional activities like heli and cat skiing or dog sledding and snowshoeing. Best of all, your personal ski guide knows these areas better than anyone and is keen to help you discover the best après ski or dining along the way. 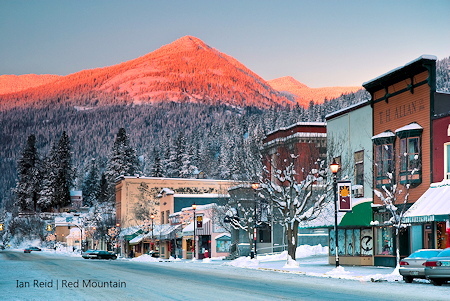 Get the low down from your guide on some of North America's best ski town culture and après ski. We'll make sure you experience the best of each town, from three amazing hot springs to Revelstoke's Village Idiot and Last Drop; Eagle's Eye, Peaks Grill and Wolf Den in Golden, 100 or more restaurants and bars in Nelson (including the best rated ski lodge food in the world), as well as Rafter's local après ski in Rossland. 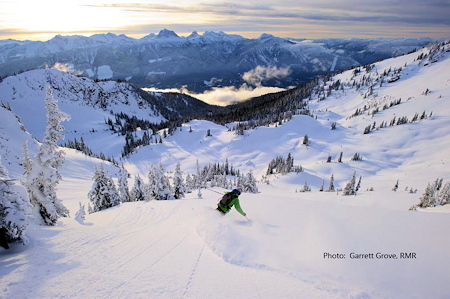 Get straight down to business on your Canada ski vacation with this 6 day guided ski tour, visiting Revelstoke Mountain Resort as well as Kicking Horse Mountain Resort. 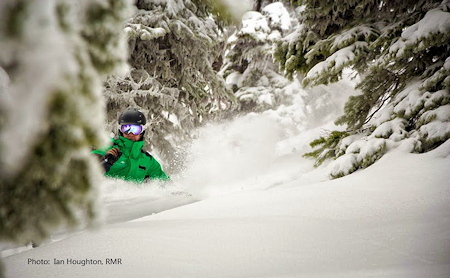 Your ski tour starts in Kelowna, where your guide will pick you up and whisk you away to a world of powder, hot springs and good times. 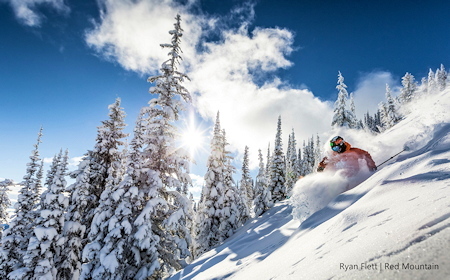 Spend the first two days of your ski vacation exploring North America's highest vertical drop at Revelstoke Mountain Resort, which is famous for its dependable snow pack, endless tree skiing and three epic bowls. Enjoy a well deserved soak in the nearby hot springs, relaxing those legs after a long day skiing in BC. Head out on the town for some group dining, trading stories of face plants and big airs. Relax in your hotel room at one of our hand picked accommodation partners. 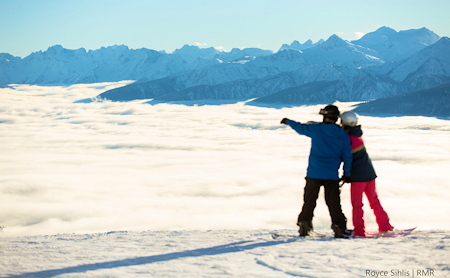 Experience the world class terrain and mountain vistas at Kicking Horse during the next two days of your Canada ski vacation. 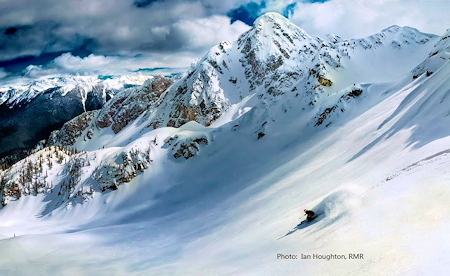 The best thing about Kicking Horse is that the terrain is spread along three mountain ridges, which hold some of the best steep skiing terrain on the planet, easily accessible by gondola. Simply ski along the ridges with your guide until you see a chute, spine, tree run or even gentle groomer that catches your fancy and away you go! Travel south through the Valley of a Thousand Peaks on the last day of your Canadian ski vacation. Stop for a soak in a beautiful set of natural hot springs right on the banks of a pristine river and reflect on the highlights of your British Columbia ski tour. You have the option to either catch a shuttle to Calgary from Golden or be dropped off at your Cranbrook or Nelson hotel, airport or bus station. Your 9 day Canada ski vacation begins the same as the 6 Day Powder Highway Ski Tour, then continues on for some truly epic BC skiing in Nelson. 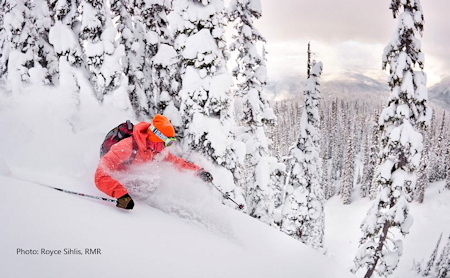 Over the course of 9 days travel along the Powder Highway, experiencing the thrills of skiing in Revelstoke and Golden, as well as the legendary skiing at Whitewater Ski Resort. Soak in 3 hot springs along the way and enjoy some of the best dining and après ski in each town with the helpful suggestions from your personal guide. 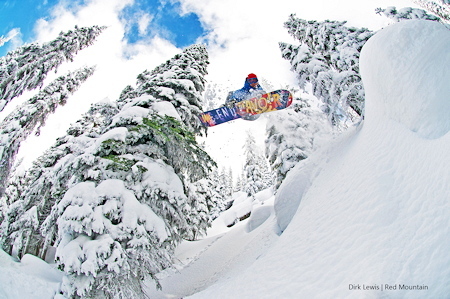 During your Canada ski vacation you will ski the highest vertical in North America and endless trees and powder filled bowls at Revelstoke, steep chutes and spines at Kicking Horse, as well as some of the world's best tree skiing and pillows at Whitewater Ski Resort. The best part about these BC ski resorts is that you will feel like you are all on your own, with no one around you during each ski run. That also means that despite having the most and the best snow in North America, these mountains get virtually no crowds, so you can kiss lift lines goodbye. Enjoy hot springs as well as genuine ski town après in Revelstoke, then try some craft beers and incredible food where the locals go for après ski at Kicking Horse. Spend the night out in Nelson, relishing the 100 or more restaurants and bars in this small town which make it one of the tastiest ski towns in Canada. 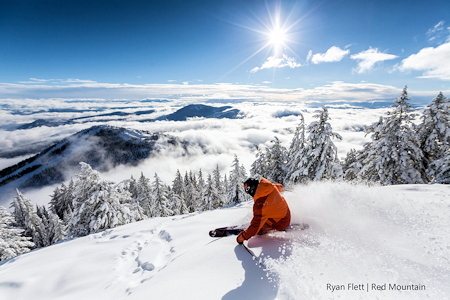 Your 9 day Canada ski tour ends in Nelson, with options to connect to Kelowna, Calgary, Vancouver or fly right out of nearby Castlegar or Trail airports. If you are looking for the ultimate ski vacation in Canada you found it. 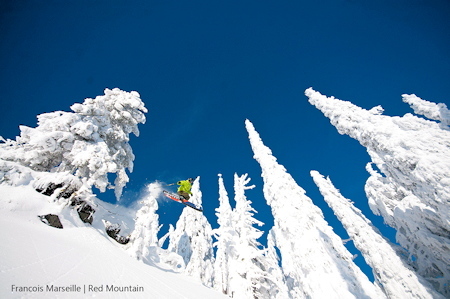 Our 11 day Powder Highway ski tour includes the powder skiing paradise of the 9 day ski tour and adds 2 days of skiing at Red Mountain in Rossland. Red Mountain has always been a heavy hitter in the powder skiing scene, but having just finished one of the largest ski resort expansions in history there are over 2800 reasons to come and experience Red. That's right, 2800 acres of playful, snowy paradise, complete with some epic après ski at Rafters makes for a perfect cherry on top of your Canada ski tour. Make your Canada ski vacation the trip of a lifetime. 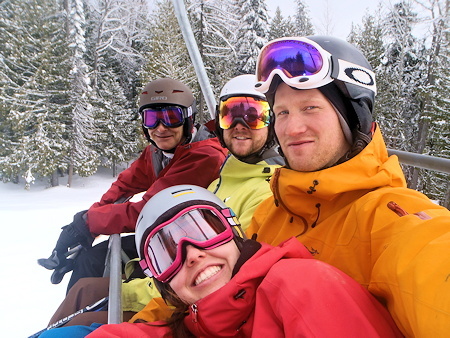 Ski Vacations and Guided Ski Tours in British Columbia, Canada.